Still under construction but furnished model available to view. 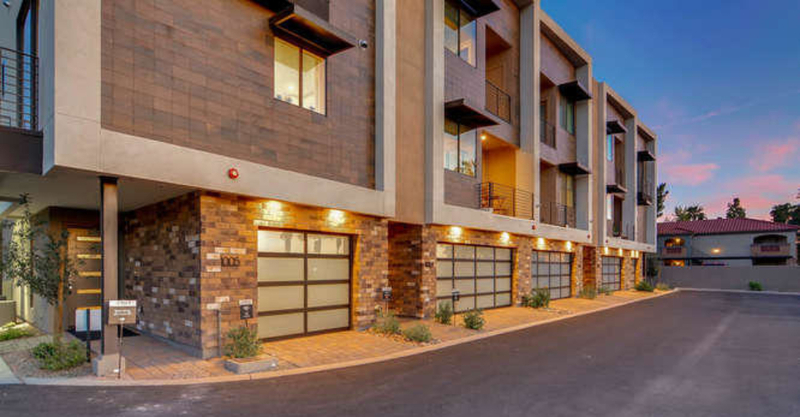 Aerium, Landmark Homes USA’s first project in Arizona, features 24 contemporary townhomes ranging from 1,429 to 1,847 square feet. Designed by renowned architect’s at Otak, the three floor plans feature attached garages, oversized balconies, private backyards, and a triecta of ”wow” factors that include open-tread staircases, sustainable quartz countertops, & jaw dropping Italian Bertazzoni gas ranges. Chef-inspired kitchens and spa-inspired master bath options are just a couple of our pre-designed optional features available. On-Site Community amenities include, a sparkling lap pool (heated in Winter months), an organic herb garden, a ramada & outdoor cooking facilities. Lush landscaping has been designed to surround the Community and walkways.